Choose ‘Send PDF to Outline’ in the PDF services meu. Easy, isn’t it? Time for Q&A then! Why PDF? It’s the surest way to preserve the exact look of a thing. Will it work for web pages only? Nope. Various documents and stuff are supported. Is it the same to the ‘Print to Outline’ which used to be a standalone utility installed over Outline for Mac? True, some users who have been there for a while might remember the magic utility for printing PDF to Outline. ‘Send PDF to Outline’ is it’s descendant. ‘Print’ required individual download and installation over a working instance of Outline for Mac. ‘Send’ is there from the moment you’ve got the mother ship installed. ‘Print’ was different for Outline from the App Store and Outline Store. ‘Send’ is the same, for the sake of easy swithing between editions. ‘Print’ knew 1 magic trick. ‘Send’ knows 3. Ok, what exaxtly can I do with ‘Send’? The options are: (1) adding the PDF copy as an attachment, (2) putting a printout to a single page, and (3) putting a printout, page per note. What’s with annotating? Text and images are there for your annotations, once the PDF arrived. Handwriting and , say, arrows of all kinds would imply you have Outline for iOS and sync the note with the PDF there for annotating. And drop us a line to tell if you like the thing! 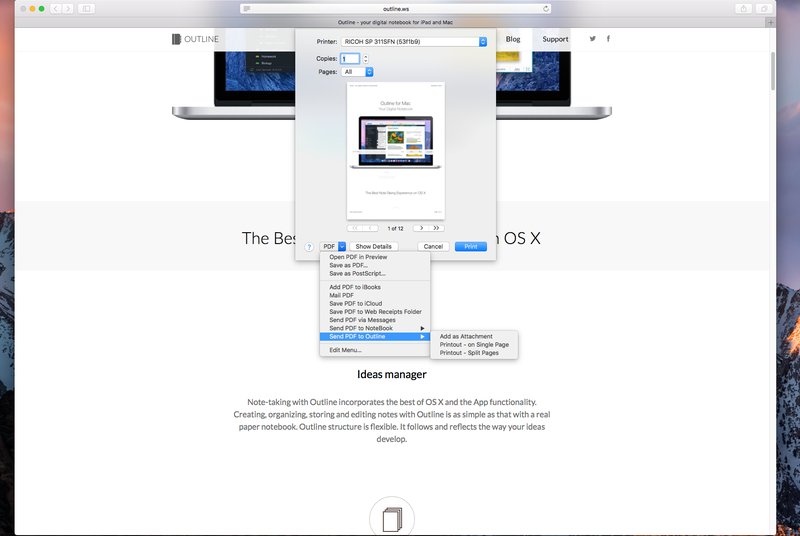 This entry was posted in New Features, Outline for Mac and tagged osx, pdf, Print to Outline, Printout, Services by Outline Team. Bookmark the permalink. Send to Outline does not appear in the services list. Print to Outline is still there. Rescue rangers from Outline tech support are on their way to help you migrate to Send PDF to Outline! Must be reaching you out via email in the next 24 hours. Me too, send to Outline does not appear in the services list. Print to Outline is still there. Error: Please select PDF Services folder. Sorry for the inconvenience! The tech support team must be reaching you out in the next 24 hours! My status still shows as “needs enabling’ I’ve also found the correct PDF Services folder with no effect. This sounds like a bug, can we get it fixed ASAP? I had the same issue, when selecting “Enable” in system wide “/Library/PDF Services” folder. Enable worked after creating a folder in “~/Library/PDF Services”, though have not tested function. Thus far seems to “Enable” needs to be done in users “~/Library/PDF Services” rather than a system wide folder.